[prMac.com] Tel Aviv, Israel - Mellel, a developer of word processing technology for professional and long-form writers, is announcing the release of Mellel 4.0. Now available to Mac users, Mellel 4.0 is a stronger, more powerful and fully-redesigned platform that gives professional writers, editors, authors and journalists a better avenue to write and edit long and oftentimes complex content such as books, articles and doctoral dissertations. Over the last 20 years, MS Word managed to capture a large portion of the word processing market, stalling the development of word processing technology, with no major updates, to accommodate writers and their unmet needs. Not to mention, the market was, and still is flooded with clones. Mellel's team tackled the problem head on, creating Mellel, and its latest version, Mellel 4,0, which now offers new writing and editing tools, designed to save professional writers hours of additional work. * Story: This feature enables users to write down (in advanced or with an existing manuscript) the plot or the main events in their story. It also lets writers set what happens in the story / manuscript, who's doing it and where it happens. * Improved Capabilities for Creating Outline: This feature enables every user to create the entire structure of their document - headings, subheadings and more. By typing directly into the Outline Pane Tool, writers can freely add more document sections, rearrange entire sections with a click of their mouse, add notes, highlights and filter headings. * Quick Indexing: This tool offers, for the first time, a professional level index tool, directly in the word processor (eliminating the need to buy additional and expensive applications, and countless other features that make the writing process more streamlined.This approach can save writers fifty percent of the time needed to create a detailed index. * Changing the hierarchy of 100 chapters and subchapters only took one minute in Mellel, compared to eight to ten minutes in MS Word. * Inserting 988 cross references to a technical guide only took 1.5 hours in Mellel, and took between seven and nine hours in MS Word. * Mellel also enables users to write and save automated functions in the Find and Replace feature capable of rewriting and editing a document with hundreds of pages, in a single second - compared to hours or even days in MS Word. "People are consuming more content these days - and doing so faster than ever, even though writers continually struggle to write on sluggish, outdated 90s technology," said Amber Massey, CEO of Mellel. "With the release of Mellel 4.0, it is our goal not only to increase the speed and stability of word processors, but also redefine what writers should expect in terms of functionality. 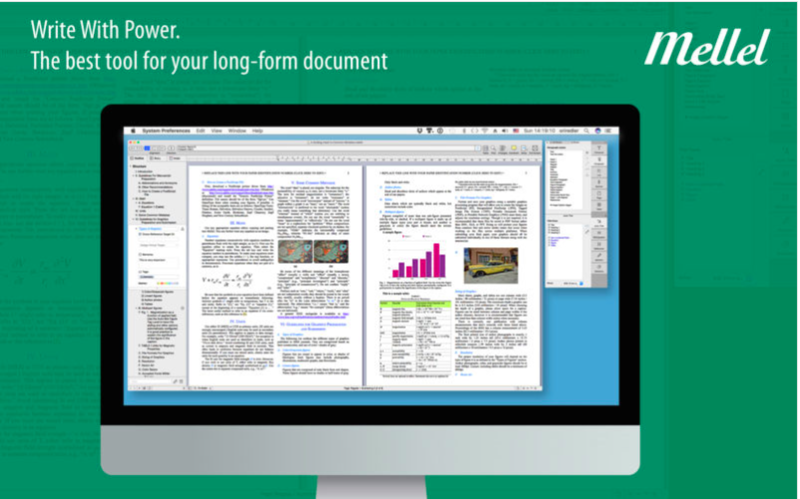 Mellel 4.0 allows users to view and type every heading in their document in one convenient place,, create indexes and edit / rearrange a document in seconds. We understand that time is an important asset, and for writers, it could mean the difference between meeting a deadline or not. As we continue to enhance our software's capabilities, it is our goal to power and empower the current, and next generation of writers, editors and academics. We want to also provide them with the best tools to streamline many of their previously mundane and tedious tasks - much of which involved manually manipulating software itself, freeing up more time to create their next great research paper, novel, or marketing white paper." Mellel is the first and only word processing software to support headings as objects, allowing for limitation-free design of titles and headings. You can learn more about Mellel through its new demo and tutorial center Mellel U. It features over 70 videos on an array of topics that allow users to master the software. You can also check out Mellel's videos on their YouTube channel. Mellel is currently available to Mac users, and its latest version can be on their website. Founded in 2002, by brothers Ori and Eyal Redler, Mellel is today lead by writer and editor, Amber Massey. She was first introduced to the software while working as an editor inside Washington's Beltway, and later joined forces with the Redlers in order to bring innovation in word processing technology to wider audiences. In 2016, Massey went from customer to CEO, having been transformed into a strong advocate of the software after benefiting greatly from its capabilities. Copyright (C) 2002-2017 Mellel. All Rights Reserved. Apple, the Apple logo, macOS, iPhone, iPad, iPod and Macintosh are registered trademarks of Apple Inc. in the U.S. and/or other countries.